A previous post listed sources of 2016 election data. An election expert at Decision Desk HQ spent a year putting together what the group says is the most detailed map available of the 2016 election: A national precinct-level map that is so granular a graphic at this scale was never produced for the 2012 election, according to Decision Desk HQ contributor Ryne Rohla in a post presenting his work. The hard work paid off in the map, which appears below and shows how President Donald Trump won the upper Midwest and carved out votes into the South up to the "Black Belt." An interactive version can also be used to zoom-in and see how your neighborhood voted. Decision Desk HQ had to temporarily take down the map due to high traffic. For every race and ethnicity, a higher proportion of college degree holders correlated with a higher swing toward Clinton, and vice versa for Trump. As I’ll delve more deeply into in another post, there exists a high degree of heterogeneity among every racial and ethnic group when it comes to their swing behavior in the 2016 General Election, and attempts to paint groups with a wide brush belie a tremendous diversity of opinion and belief. The weight of evidence implies economics, education, and class divided people far more than their skin color in terms of their reactions to Clinton and Trump, and they did so in a systematic and symmetric manner; in this way, we’re all more alike than different. Moderate House Republicans have apparently rejected overtures from the conservative House Freedom Caucus — the most critical group in sinking the Republican bill to repeal and replace Obamacare — which was seeking talks about whether a compromise repeal plan is possible. Rep. Chris Collins, R-N.Y., — one of President Trump's closest allies in the House — told reporters Thursday that the moderates' caucus, called the "Tuesday Group," met and "unequivocally" decided not to meet with the Freedom Caucus. Last Monday morning, shortly before the start of the hearing, a senior White House official told me, "You'll see the setting of the predicate. That's the thing to watch today." He suggested that I read a piece in The Hill about incidental collection. The article posited that if "Trump or his advisors were speaking directly to foreign individuals who were the target of U.S. spying during the election campaign, and the intelligence agencies recorded Trump by accident, it's plausible that those communications would have been collected and shared amongst intelligence agencies." The White House clearly indicated to me that it knew Nunes would highlight this issue. "It's backdoor surveillance where it's not just incidental, it's systematic," the White House official said. "Watch Nunes today." Why this matters: With the credibility of his Russia investigation under question — even from Republicans — Nunes needs to prove he hasn't colluded with the Trump administration. Lizza's reporting surely doesn't help. To expand his real estate developments over the years, Donald Trump, his company and partners repeatedly turned to wealthy Russians and oligarchs from former Soviet republics — several allegedly connected to organized crime, according to a USA TODAY review of court cases, government and legal documents and an interview with a former federal prosecutor. At Politico, Steven Shepard reports that Democratic polling in 2016 appears to have missed many rural white voters. One possibility is that they did not accurately disclose their voting intentions. Another is nonresponse bias. "A lot of Democrats don't trust Trump and don't trust the administration," Ohio Rep. Tim Ryan told RCP. "They've poisoned the well to try to actually bring the country back together and start finding things to work on together." Ryan's northeast Ohio district encompasses areas of Youngstown and Warren, blue-collar bastions that helped to buoy Trump. While Trump lost Ryan's district, he outperformed Mitt Romney there by 10 points. Ryan challenged Nancy Pelosi earlier this year for House minority leader, arguing that the party had lost touch with its working-class constituents. But Ryan maintains Trump is "completely betraying" them with his hiring of Wall Street executives for his Cabinet and for backing an Obamacare replacement plan that the Congressional Budget Office said would disproportionally impact older and poorer Americans. From Warren G. Harding's acceptance address, June 12, 1920: "I believe Federal departments should be made more business-like and send back to productive effort thousands of Federal employees, who are either duplicating work or not essential at all." Blaming Democrats: "Look, we got no Democratic votes. We got none, zero," Mr. Trump told the New York Times on Friday after the bill was pulled from the House floor. "The good news is they now own health care. They now own Obamacare." Blaming the House Freedom Caucus: "Democrats are smiling in D.C. that the Freedom Caucus, with the help of Club For Growth and Heritage, have saved Planned Parenthood & Ocare!" Trump tweeted the next day, on Saturday morning. Blaming Republican moderates: "You can blame it on the Freedom Caucus if you want to. But there's also a lot of moderates, Charlie Dent will be on your show in a little bit, who are also against the bill," Trump OMB Director Mick Mulvaney said on "Meet the Press" yesterday. Blaming Washington: "I think more importantly, we haven't been able to change Washington in the first 65 days. And I think if there's anything that's disappointing and sort of an educational process to the Trump administration was that this place was a lot more rotten than we thought that it was, and that I thought it was, because I've been here for six years," Mulvaney added on "Meet the Press." Trump’s glaring unfamiliarity with the issues and distaste for policy made him wholly ineffective in addressing the substantive concerns of lawmakers. A purely transactional approach in which nothing matters but the deal turns out to be useless when trying to enact policies, as opposed to trying to get voters to pick you over another candidate. As an amateur in politics with no intellectual curiosity, Trump had no policy knowledge himself nor even an idea of the sorts of people he would need and what skills could be valuable for them to have. He admires only billionaires and generals who “look the part,” but he needs grizzled political pros who live and breathe politics. He mistakenly chose cronies who made him feel comfortable but who could not devise a plan that reflected his campaign message. (Reince Priebus and Stephen K. Bannon have never drafted a simple bill, let alone constructed a redesign of the health-care system.) Trump outsourced his most important legislative initiative, didn’t bother to understand the conflicts within the GOP, didn’t have the staff to explain what he needed to do and therefore was left with ineffective buzzwords and trite phrases that fell on deaf ears. 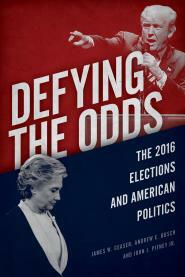 In Defying the Odds, we discuss the cultural and political division between College America and Non-College America. Anne Case and Angus Deaton garnered national headlinesin 2015 when they reported that the death rate of midlife non-Hispanic white Americans had risen steadily since 1999 in contrast with the death rates of blacks, Hispanics and Europeans. Their new study extends the data by two years and shows that whatever is driving the mortality spike is not easing up. "Guys, look. This is not a discussion. This is not a debate. You have no choice but to vote for this bill." Bannon's point was: This is the Republican platform. You're the conservative wing of the Republican Party. But people in the room were put off by the dictatorial mindset. One of the members replied: "You know, the last time someone ordered me to something, I was 18 years old. And it was my daddy. And I didn't listen to him, either." It was a crucial misreading of Meadows, who has been determined to please both the White House and his conservatives colleagues on the Hill. Upon assuming the chairmanship of the Freedom Caucus earlier this year, Meadows was viewed suspiciously by some of his members who worried that the North Carolina congressman is too cozy with Trump and would hesitate to defy him. Meadows campaigned extensively with Trump last fall and struck up a relationship with White House chief strategist Steve Bannon, who communicates with him almost daily by text. Meadows knew the health care fight would be viewed as a test of his independence from Trump, and the moment the president called him out, he was boxed in. This small line is an important historical marker of the bizarre and disconcerting reality into which American politics has plunged. Trump is not merely making an attack on truth here. He is attacking the idea of truth. His statement is a frontal challenge to the notion that objective reality can be separated from power. The political appointee charged with keeping watch over Environmental Protection Agency Administrator Scott Pruitt and his aides has offered unsolicited advice so often that after just four weeks on the job, Pruitt has shut him out of many staff meetings, according to two senior administration officials. At the Pentagon, they’re privately calling the former Marine officer and fighter pilot who’s supposed to keep his eye on Defense Secretary Jim Mattis “the commissar,” according to a high-ranking defense official with knowledge of the situation. It’s a reference to Soviet-era Communist Party officials who were assigned to military units to ensure their commanders remained loyal. "The undersigned, N. S. Rubashov, former member of the Central Committee of the Party, former Commissar of the People, former Commander of the 2nd Division of the Revolutionary Army, bearer of the Revolutionary Order for Fearlessness before the Enemy of the People, has decided, in consideration of the reasons exposed above, utterly to renounce his oppositional attitude and to denounce publicly his errors." President Donald Trump's former campaign chairman, Paul Manafort, secretly worked for a Russian billionaire to advance the interests of Russian President Vladimir Putin a decade ago and proposed an ambitious political strategy to undermine anti-Russian opposition across former Soviet republics, The Associated Press has learned. The work appears to contradict assertions by the Trump administration and Manafort himself that he never worked for Russian interests. But in the United States, members of the Russian elite have invested in Trump buildings. A Reuters review has found that at least 63 individuals with Russian passports or addresses have bought at least $98.4 million worth of property in seven Trump-branded luxury towers in southern Florida, according to public documents, interviews and corporate records. In 2011, a Russian information war manual concluded that operations in what Russians like to call the "psychosphere" were more important than conventional military engagements. The chief of staff of the Russian armed forces concurred in 2013. The basic aim of war, he averred, was to get inside the national mind of the enemy, reconfiguring habits of mind and frames of discourse so that Americans would do what the Russian leadership wanted. After the Russian invasion of Ukraine in 2014, the main enemy was the United States. The information manual very well describes the experience of being an American citizen in 2016: "the population doesn't even feel it is being acted upon. So the state doesn't switch on its self-defense mechanisms." Even though many American citizens had a vague sense that something was uncanny about the presidential campaign, and those who read the newspaper knew that Russia was interfering, few realized the scale of the operation or its significance. The claim that GCHQ carried out surveillance on Donald Trump during the election campaign is "arrant nonsense", Rick Ledgett, the number two at the US National Security Agency (NSA) has told the BBC in an exclusive interview. A commentator on Fox News had claimed that GCHQ had carried out the activity on America's behalf, but Mr Ledgett said the claim showed "a complete lack of understanding in how the relationship works". "Of course they wouldn't do it. It would be epically stupid," he told me. "Our job in the intelligence community is to be apolitical. Our job is to speak truth to power," he emphasised. The origins of much of the tension lie in the assessment by the US intelligence community that Russia interfered in the presidential election, and the subsequent reaction from Donald Trump. Mr Ledgett said the evidence of Russian involvement was "extraordinarily strong" and "irrefutable" and that the NSA had played a key role in establishing the case. Mr Ledgett said he was "dead solid 100% confident" that the Russian state was behind the attempts - although he said it was not for the intelligence community to evaluate the actual impact of those attempts on the vote itself. Congress for many years has ranked low in public esteem—joining journalists, bankers, and union leaders at the bottom of polls. And in recent years there’s been good reason for the public disregard, with the rise of hyper-partisanship and the increasing inability of Congress to carry out its required duties, such as passing spending bills on time and conducting responsible oversight of the executive branch. Congress seems so dysfunctional that many observers have all but thrown up their hands in despair, suggesting that an apparently broken U.S. political system might need to be replaced. Now, some of the country’s foremost experts on Congress are reminding us that tough hyper-partisan conflict always has been a hallmark of the constitutional system. Going back to the nation’s early decades, Congress has experienced periods of division and turmoil. But even in those periods Congress has been able to engage in serious deliberation, prevent ill-considered proposals from becoming law—and, over time, help develop a deeper, more lasting national consensus. The ten chapters in this volume focus on how Congress in the twenty-first century can once again fulfill its proper functions of representation, deliberation, legislation, and oversight. The authors offer a series of practical reforms that would maintain, rather than replace, the constitutional separation of powers that has served the nation well for more than 200 years. William F. Connelly, Jr., is the John K. Boardman Politics Professor at Washington and Lee University. He is also founder and director of the university’s Washington Term Program. John J. Pitney, Jr., is Roy P. Crocker Professor of American Politics at Claremont McKenna College. He previously served on the staff of Senator Alfonse D’Amato (R-NY) and the House Republican Policy Committee. Gary J. Schmitt is resident scholar at the American Enterprise Institute, where he directs the Program on American Citizenship. He previously served as the Democratic staff director of the Senate Select Committee on Intelligence and executive director of the President’s Foreign Intelligence Advisory Board. Matea Gold reports at The Washington Post that the Mercers, unlike the Kochs, have focused more on media than voter mobilization. 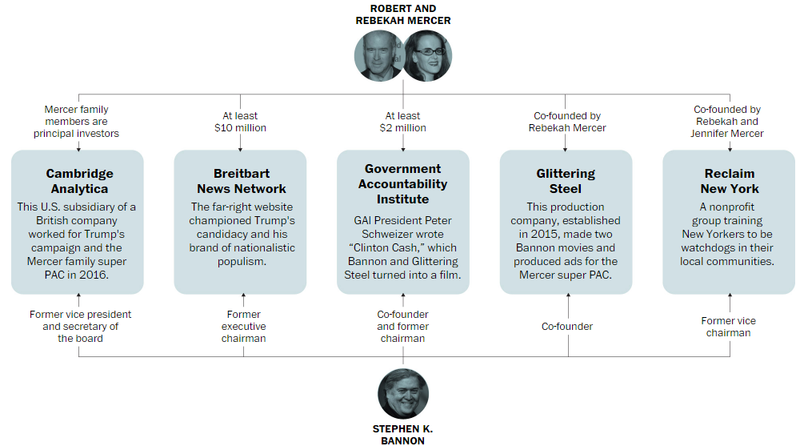 The Mercers’ partnership with Bannon began in 2011, thanks to an encounter that Robert and Rebekah had with Andrew Breitbart. 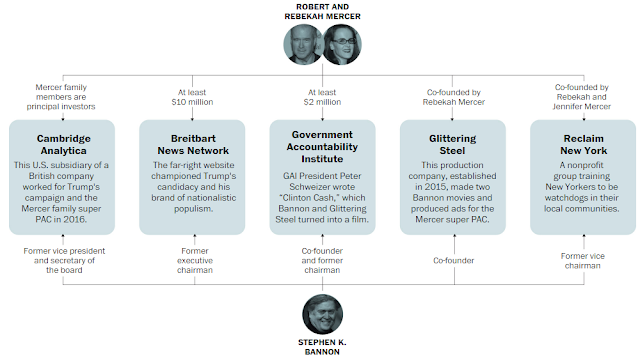 During a spring meeting of Club for Growth donors at the Ritz Carlton in Palm Beach, Fla., the Mercers sought out Breitbart after watching him deliver a talk about how to co-opt the political strategies used by liberals. The conservative media entrepreneur, who liked to denounce the mainstream press as the Democrats’ “dominant partner in crime,” was arguing at the time that government policies could not be changed until conservatives seized control of the media narrative. The message resonated with the Mercers, according to a person familiar with their views. Breitbart introduced them to Bannon, then a screenwriter and producer in Southern California who was directing a movie called “Occupy Unmasked” that featured Breitbart. It was co-produced by the conservative advocacy group Citizens United, whose allied foundation would later receive Mercer funds. The Mercers also joined the Council for National Policy, which the Times has described as a “little-known club of a few hundred of the most powerful conservatives in the country.” The Mercers have contributed hundreds of thousands of dollars. The group swears participants to secrecy. But a leaked 2014 roster revealed that it included many people who promoted anti-Clinton conspiracy stories, including Joseph Farah, the editor of WorldNetDaily. The group also brought the Mercers into the orbit of two people who have become key figures in the Trump White House: Kellyanne Conway, who was on the group’s executive committee, and Steve Bannon. With election results finally certified by state election offices, Nonprofit VOTE and the U.S. Elections Project release “America Goes to The Polls,” a report that ranks all 50 states in voter turnout for the 2016 election and identifies policies that help contribute to higher turnout. National turnout of eligible voters was 60.2% – 1.6 percentage points above the 58.6% turnout in 2012, though slightly lower than 2008. Four in ten eligible voters did not vote. The highest turnout states were Minnesota (74.8%), Maine (72.8%), New Hampshire (72.5%), Colorado (72.1%), Wisconsin (70.5%), and Iowa (69.0%). All six offered same day voter registration, enabling voters to register or update their registration when they vote. Five were battleground states targeted by the presidential campaigns. The lowest turnout states were Hawaii (43%), West Virginia (50.8%), Texas (51.6%), Tennessee (52.0%) and Arkansas (53.1%). These five states were at the bottom for the third consecutive presidential election. None were battleground states. All five cut off the ability to register or update a registration three to four weeks before Election Day. The report also highlights new data on the low level of electoral competition in both the presidential race and House races – a major contributor to low voter turnout in non-competitive states and districts. 147 million (65%) of the nation’s eligible voters live in non-battleground states where the outcome is largely a foregone conclusion. The major presidential candidates understand this and thus invested less than 10% of their ad spending and campaign visits on reaching those voters. Competition for U.S. House races hit its lowest mark in at least 30 years. Just 33 House races ended with margin of victory between the top two candidates of 10% points or less. Most House races (74%) were landslides or uncontested. The report features a range of state policies to promote voter participation and improve the voting process such as same day voter registration, automatic and online voter registration, as well as policies that could increase competition, such as Electoral College reform and nonpartisan redistricting. To download America Goes to the Polls 2016, visit www.americagoestothepolls.org. In quick succession on Wednesday night, federal judges in Hawaii and Maryland blocked President Trump’s revised travel ban. They said statements Mr. Trump had made as a presidential candidate, including his call for “a total and complete shutdown of Muslims entering the United States,” helped doom the executive order. Trump boosters say his freewheeling rhetoric, in person and on social media, is a large part of his appeal and has kept him in good stead with his political base. But it is also making governing more challenging. In recent weeks, Trump has pledged that he would provide “insurance for everybody” at a lower cost, setting an impossible standard for congressional Republicans as they seek to craft a bill to scale back Obama’s signature health-care law. And Trump’s allegations on Twitter — without citing any evidence — that Obama wiretapped Trump Tower last year has eaten up investigative resources in Congress and chipped away at his credibility among GOP leaders key to advancing the president’s ambitious agenda. But perhaps nowhere have Trump’s words been as damaging as his attempts to implement the travel ban — which may have been damaged further by Trump’s remarks at his Nashville rally. Trump inflamed controversy during the campaign by calling for a temporary ban on all foreign Muslims from entering the United States, then later shifted to vague pledges to ban people from countries with a history of Islamist terrorism. “I am sure that challengers will use the president’s comments last night as further evidence that the true intent of his executive order is to bar Muslim immigration,” said Stephen W. Yale-Loehr, a professor of immigration law at Cornell Law School. Trump is unaccustomed to being held accountable for his words. As a real estate mogul and reality TV star, he thrived on over-the-top claims and attention-getting hype. His approach, honed through decades working with New York tabloids, deeply frustrated his political rivals during the presidential campaign and sent fact-checkers into overdrive. His campaign advisers responded by encouraging voters and the media to take him seriously, but not literally. But that's not an option for the president of the United States. His words can move financial markets, reassure or unnerve allies, quiet or antagonize opponents, set the direction for administration policy and — as Trump saw this week — carry significant legal weight. Heckuva job on vetting, Orangie. Sebastian Gorka, a top national security adviser to President Trump, stonewalled when BuzzFeed News asked about a report that he belongs to a Nazi-allied group. “Send a request to White House press,” Gorka told BuzzFeed News. “I have never been a member of the Vitez Rend. I have never taken an oath of loyalty to the Vitez Rend. Since childhood, I have occasionally worn my father’s medal and used the ‘v.’ initial to honor his struggle against totalitarianism.” It’s a perfectly plausible explanation, and you’d have to be of a very specific mindset to still pursue allegations of Nazi affiliation. Today there is duplication and redundancy everywhere. Billions and billions of dollars are being wasted on activities that are not delivering results for hardworking American taxpayers, and not even coming close. This order requires a thorough examination of every executive department and agency to see where money is being wasted, how services can be improved, and whether programs are truly serving American citizens. The Director of Office of Management and Budget will oversee the evaluation working with experts inside and outside of the federal government, as well as seeking input from the American people themselves. Based on this input, we will develop a detailed plan to make the federal government work better -- reorganizing, consolidating, and eliminating where necessary: In other words, making the federal government more efficient and very, very cost productive. President Obama said the same thing ... a number of times. In 2013: "I've proposed and signed into law the elimination of dozens of Federal programs and cut even more that were either duplicative, not working, or no longer needed, saving billions of dollars a year. And the basic principle is simple: Taxpayers deserve the biggest bang for their buck, especially at a time when budgets are tight, and we've got to do a lot more with less." In 2012: "No business or nonprofit leader would allow this kind of duplication or unnecessary complexity in their operations. You wouldn't do it when you're thinking about your businesses. So why is it okay for our Government? It's not. It has to change." In 2011: "So we've received nearly 20,000 suggestions from Federal employees. I just completed a videoconference with the 4 finalists of our annual SAVE Award, 20,000 submissions of ideas from Federal employees about how we can reduce waste, eliminate duplication, redundancy, paperwork." In 2010: "We have gone through every department's spending, line by line, item by item, looking for inefficiency, duplication, and programs that have outlived their usefulness." In 2009: "And that means investing in priorities like energy and health care and education that will grow our economy again. But it also means eliminating those programs that are wasteful and duplicative and that we simply cannot afford. We have to once again live within our means." She credits her presence to “Indivisible: A Practical Guide for Resisting the Trump Agenda.” Modeled on the success of the conservative Tea Party, the 24-page step-by-step activist playbook has exploded since it went online three months ago. It’s been downloaded almost 2 million times since then by people who want to interrogate Republicans like Rep. Tom McClintock at a town hall in Mariposa or goad Democrats like Sen. Dianne Feinstein into attending one in Oakland. What started out as some congressional staffers sharing organizing tips has mushroomed into an organization that has inspired small, autonomous groups across the nation. Not surprisingly, many of the 5,802 “Indivisible”-inspired groups have emerged in the predominantly liberal Bay Area — 200 across six congressional districts. Indivisible is just one of the political startups working to channel that liberal anxiety in the current political landscape. Others, like Sister District Project, Flippable, Swing Left and the Resurgent Left, are focused on showing progressives how to campaign in red Congressional districts or state races where their help and cash will be needed. Sen. Tom Cotton warned House Republicans on Sunday that the House Republican Obamacare replacement bill can't pass the Senate as written — and that they could lose the House in next year's elections if they vote for it. "I'm afraid that if they vote for this bill, they're going to put the House majority at risk next year," Cotton said on ABC's "This Week." He warned that it would have "adverse consequences for millions of Americans" and wouldn't lower costs: "Do not walk the plank and vote for a bill that cannot pass the Senate and then have to face the consequences of that vote." "George, you were in White House in 1993. You remember when House Democrats voted for a BTU energy tax, not only did that not become law, it didn't even get a vote in the Senate. And those Democrats lost their next election because they voted on that tax, getting BTU'd." In 1993, President Bill Clinton pressed congressional Democrats to vote for proposal to tax the heat content of fuels — the so-called “BTU tax.” Rank-and-file House Dems didn’t like it, but many of them grudging went along, following Clinton’s lead. A few months later, budget talks stalled in the Senate, and the White House felt it had no choice but to drop the BTU measure. A year later, vulnerable House Dems were slammed with attack ads for having voted for the measure — and having nothing to show for it — and the issue likely contributed to Democrats losing their majority in 1994. But only about 11 percent of current House members were around at the time. In fact, Trump’s impact on voting patterns was not to increase the share of the white vote won by the Republican presidential candidate. Both Trump and Mitt Romney carried whites by the same 20-point margin. The big shift Trump wrought was to change the type of whites who voted Republican. From 1948, when American National Election Studies began polling, to 1964, college-educated voters were decisively Republican and those with high school degrees or less were reliably Democratic. In 1960, for example, voters with high school degrees or less voted 54-46 for John F. Kennedy while those with college and postgraduate degrees voted 62-38 for Richard Nixon. Beginning in 1968, when Southern whites and some working class whites in the North began to abandon the Democratic Party, Republican candidates made major inroads among non-college voters. Nixon won voters with high school degrees with 52 and 67 percent in 1968 and 1972; Ronald Reagan won them with 55 and 58 percent in 1980 and 1984. As a result, from 1980 to 1992, whites with and without college degrees generally cast similar margins for Republican presidential candidates. The pattern of white college and non-college voting is shown in the accompanying chart, which relies on data from the Pew Research Center.Starting in the 2000 election between George W. Bush and Al Gore, non-college whites became substantially more Republican in their presidential voting than whites with degrees. By 2012, Mitt Romney won whites with degrees by 14 points and those without degrees by 25 points. In 2016, however, Trump won college-educated whites by four points and non-college whites by a record-setting 39 points, a larger margin than Ronald Reagan, the previous record-holder at 29 points. Put another way, insofar as Trump voters define the contemporary Republican electorate, non-college whites are the majority, 55.1 percent, with college -educated whites becoming the minority at 44.9 percent. I wish we could drop into the Potomac all those obsolescent conservatives who are still preoccupied with Alger Hiss and General MacArthur, and who keep trotting out laissez faire economics and other dead horses. They make the Republican party look musty to millions of ignored working‐class people who are looking for a party that relates to their needs. Trump has oriented the party toward heightened anger, intensified racial resentment, animosity to immigrants and opposition to trade. This is an exceptionally volatile mix. Trump is fanning rather than quelling the flames — everything he has done so far has been to raise, not lower, the heat. The next question is whether the Republican Party will be able to continue to exploit this mix or whether it will boil over in ways that cannot be predicted. BOB FRANKEN: Oftentimes people say that your political speeches are really Professor Newt lecturing to a larger audience. Rep. NEWT GINGRICH: They are. They are. Very deliberately so. I am the most seriously professorial politician since Woodrow Wilson. I believe the purpose of my speeches is didactic. They're supposed to be educational. BOB FRANKEN: So you're educating your peers, your political peers? Rep. NEWT GINGRICH: The citizenry. “I’m pretty happy being anti-intellectual,” he said. “We have a lot of academics and intellectuals in this country who are just wrong. Rep. Jim Cooper has a list of organizations opposing Trumpcare. Add the American Nurses Association, too. AARP: This bill would weaken Medicare’s fiscal sustainability, dramatically increase health care costs for Americans aged 50-64, and put at risk the health care of millions of children and adults with disabilities, and poor seniors who depend on the Medicaid program for long-term services and supports and other benefits. American Medical Association: …we cannot support the AHCA as drafted because of the expected decline in health insurance coverage and the potential harm it would cause to vulnerable patient populations. As you consider this legislation over the coming days and weeks, we hope that you will keep upmost in your mind the potentially life altering impact your decisions will have on millions of Americans who may see their public, individual or even employer-provided health care coverage changed or eliminated. American Hospital Association: Any ability to evaluate The American Health Care Act, however, is severely hampered by the lack of coverage estimates by the Congressional Budget Office (CBO). Lacking that level of analysis and needed transparency, we urge that Congress should wait until an estimate is available before proceeding with formal consideration. Federation of American Hospitals: Based on our review of the American Health Care Act (AHCA) as currently drafted, and in the absence of a Congressional Budget Office analysis and estimate of the cost and coverage impacts that might allay our concerns, we have significant issues with this legislation. American Diabetes Association: On behalf of the nearly 30 million Americans living with diabetes and the 86 million more with prediabetes, the American Diabetes Association (Association) is writing to express our serious concerns with the American Health Care Act…we have serious reservations about many of the proposals in this bill. Our initial areas of concern include the tax credit proposal, proposed changes to Medicaid, potential disruption of coverage and repealing the prevention and public health fund. American Cancer Society Cancer Action Network:…reduced federal funding combined with state-specific eligibility and enrollment restrictions will likely result in fewer cancer patients accessing needed health care. For low-income individuals these changes could be the difference between an early diagnosis when outcomes are better and costs are less or a late diagnosis where costs are higher and survival less likely. American Health Care Association (AHCA)/National Center for Assisted Living (NCAL): The residents in long term care centers are uniquely vulnerable. More than one million individuals call nursing centers their home and most rely on Medicaid for their care. This bill will cut Medicaid funding for seniors and individuals with disabilities, jeopardizing access to the care they need. We strongly encourage Congress to protect Medicaid access for seniors and people with disabilities in the Obamacare repeal and replace effort. America’s Essential Hospitals: We are particularly disappointed lawmakers seem willing to consider this bill in committee without a Congressional Budget Office score and an estimate of how the bill might impact healthcare coverage. A score is crucial, as this legislation could place a heavy burden on the safety net by reducing federal support for Medicaid expansion over time and imposing per-capita caps on the program. America’s Hospitals and Health Systems: We are very concerned that the draft legislative proposal being considered by the House committees could lead to tremendous instability for those seeking affordable coverage. Furthermore, we are deeply concerned that the proposed Medicaid program restructuring will result in both the loss of coverage for current enrollees as well as cuts to a program that provides health care services for our most vulnerable populations, including children, the elderly and disabled. American Public Health Association: This proposal would jeopardize the health and lives of many millions of Americans…American lives are on the line…It is particularly troubling that legislators plan to consider this proposal without a score from the Congressional Budget Office. We urge House members to oppose this plan and instead strengthen our nation’s commitment to improving the health and safety of all Americans. National Disability Rights Network: The legislation revealed by House Republicans last night is a giant step backwards in the treatment and care of individuals with disabilities…It permits discrimination against people with disabilities in the insurance market for their pre-existing conditions…The National Disability Rights Network urges the House not to send people with disabilities back to a time when it was nearly impossible for us to obtain health insurance, live in the home of our choice or participate in community life. We will never go back to those days. Never. Consortium For Citizens with Disabilities: While many of the policy points are troubling, it is simply unconscionable to use the Medicaid program to pay for the repeal of the ACA, the repeal of corporate and provider taxes, and to provide new tax benefits for individuals. Medicaid provides services and supports that maintain the health, function, independence, and well-being of 10 million enrollees living with disabilities. Easterseals: Easterseals is greatly concerned that AHCA removes the federal funding guarantee that currently exists in Medicaid. People with disabilities rely on Medicaid-funded services such as attendant care, adult day and home health services to remain in their homes and communities and live productive lives. National Family Planning & Reproductive Health Association (NFPRHA): When people do not have access to the family planning care and education they need, they are more vulnerable to sexually transmitted disease and at a greater risk of unintended pregnancy and poor birth outcomes, all of which have high personal costs and translate into increased expense across the entire health care system. Lawmakers should block this dangerous measure and return to thoughtful, bipartisan deliberation on improving access to affordable, high-quality health care in this country. There is too much at stake. National Partnership Women and Families: The Republican repeal bill is an affront to women and families. It reflects its authors’ determination to deny women access to quality, affordable health care, including the comprehensive reproductive health care and abortion services that are essential to their health, equality and economic security… This bill takes us back to the days when there were few benefit standards or consumer protections in place – to a time when insurers were the ones who decided what and who they would cover, what doctors we could see, and where we could get care. National Physicians Alliance: The National Physicians Alliance opposes the draft Republican House bill revealed last night. We believe the drastic cuts it proposes to Medicaid, coupled with the substantial reductions in subsidies that helped millions afford healthcare would be extremely detrimental to our patients… All the while, the proposed legislation hands millionaires, billionaires and health insurance CEOs a massive new tax break. AFL-CIO: The reality is, this isn’t a healthcare plan at all. It’s a massive transfer of wealth from working people to Wall Street. For more than a century, the labor movement has fought to make health care a right for every American. The Republican plan contradicts this very idea by making care less affordable and accessible. It’s bad for healthcare, it’s bad for working families, it’s bad for our economy and we will fully oppose it. American Federation of State, County, and Municipal Employees: The replacement plan put forward by congressional leadership is no replacement at all for the tens of millions of Americans who rely on the Affordable Care Act to keep their families healthy without fear of bankruptcy. It is simply a tax cut for corporations and the wealthy, funded by gutting Medicaid and shifting health care costs onto states and working families. National Council of La Raza (NCLR): This bill is a threat to America’s well-being and represents a step back to the days when health insurance was financially out of reach for too many working Americans. Our nation’s future depends on healthy and hard-working families. The changes to Medicaid will devastate a program that is a lifeline for 74 million vulnerable Americans, including children, people with disabilities, and 18 million Latinos. This effort to radically change the financing structure of Medicaid will jeopardize their lives. Asian & Pacific Islander American Health Forum: Many things are clear from the bill, yet many unknowns remain. What we know is that millions of Americans, including Asian Americans, Native Hawaiians and Pacific Islanders (AAs and NHPIs) relying on coverage under the ACA will be worse off. Under the guise of flexibility, this plan would end Medicaid as we know it by phasing in per-capita caps. National Committee to Preserve Social Security & Medicare: The ACA is a highly complex piece of legislation that includes many benefit increases for seniors on Medicare, contains many program improvements that help to drive the cost of health care down and extends the solvency of the Part A trust fund. For these reasons, we strongly believe that any replacement legislation should do no less than the ACA for our senior population. National Center for Transgender Equality: Under this bill, millions would lose coverage and millions more would pay more for their health care…President Trump and leaders in Congress don’t seem to understand that this is not a political exercise—they are playing with millions of Americans’ lives. United Methodist Church: This bill has been promoted as a “fix” to the health care system in the United States but will do nothing to improve access and affordability. Instead, it will harm many in the congregations and communities in which we live and serve. People will die because of efforts like this to roll back health care. The Episcopal Church: This current proposal falls woefully short of our spiritual calling to care for the ‘least of these,' as well as the noble values upon which our great nation was founded. Catholic Health Association of the United States: We strongly encourage the full House to reject this ‘replacement’ bill and work to craft legislation that addresses the real issues without creating unneeded chaos in the system and coverage loss for those who need health care. American Federation of Teachers (AFT): That Republicans are now trying to ram something through after keeping it under lock and key makes it clear that they want to hide the details and cost from the American people. If something sounds too good to be true, it is. They know that if their true intent were exposed, Americans would soundly reject their efforts. National Education Association: It’s time for the Republican leadership to come clean with the American people. Repealing the ACA will harm our students and their families by forcing cuts to critical programs, reducing financial support for lower-income Americans, and taxing the middle class. Bottom line, working Americans will pay more for less coverage while insurance executives and the wealthy get handouts. American Federation for Suicide Prevention: We must ensure the gains we have made in mental health and substance use disorder coverage remain in place so every American has a path to a more healthy and productive life. National Women’s Law Center: The House Republican ACA repeal bill would be devastating for women. Rather than protecting access to care and coverage, this bill undermines the infrastructure of our nation’s health system, targets low-income individuals, and restructures the system in favor of wealthier individuals. All of this comes at the expense of women, who will be particularly harmed by the repeal bill. Cystic Fibrosis Foundation: The bills released by the two House committees this week fail to adequately protect people living with cystic fibrosis and place the lives of millions of Americans living with serious and chronic diseases at risk. HIV Medicine Association: These proposals will not only harm individuals with HIV but will compromise our nation’s public health by leaving fewer with access to the antiretroviral treatment that keeps patients healthy and reduces their risk of transmitting HIV to near zero. We strongly urge the committees to reconsider the bill and the accelerated and non-transparent process with which these proposals have been advanced. Federal AIDS Policy Partnership: This is likely to result in a loss of coverage and services for individuals with HIV and millions of other low income individuals with chronic illnesses and diseases whose access to healthcare and lives depend on this vital program. Formal analysis and comment by the Congressional Budget Office, the Medicaid and CHIP Payment Access Commission and the Government Accountability Office is critical to evaluate how the 70 million Americans who rely on this program stand to be affected by the proposed changes. Leadership Conference on Civil and Human Rights: This proposal is truly disheartening. It doesn’t ensure that all Americans will continue to have health coverage, as its supporters claim. Rather, it drastically cuts financial assistance for low-income people living at or below the poverty line, undermines and places severe limitations on the Medicaid expansion, and proposes to defund Planned Parenthood centers from the Medicaid program. MomsRising: The American Health Care Act makes a mockery of every campaign promise Donald Trump made about health care. It sets the stage for deep, punitive, permanent cuts to Medicaid in just a few years, which would cause grave harm resulting in rationing care for some of the most vulnerable people in our country: low-income families, pregnant women, people with disabilities and the elderly. The Republican plan would allow insurance companies to raise premiums and out-of-pocket costs, especially for seniors. The only winners would be the wealthy. Children’s Defense Fund: The American Health Care Act would reverse progress and make children worse off by depriving them of the comprehensive and affordable child-appropriate coverage they are guaranteed today, jeopardizing their futures and also the nation’s future economic and national security. Families USA: The GOP health care proposal would be laughable if its consequences weren’t so devastating. This bill would strip coverage from millions of people and drive up consumer costs. It shreds the Medicaid social safety net that serves more than 72 million people, including many children, senior citizens and people with disabilities. And it once again leaves millions of people in America with chronic illness and disease at the mercy of insurance companies. Consumers Union: The American Health Care Act would, as currently written, be a major step backwards for our nation’s children…marking up a bill that will impact millions of lives without a CBO score and without providing transparency and allowing for fair review is irresponsible and unfair to consumers. Sister Simone Campbell, NETWORK Advocates for Catholic Social Justice: Our test for any ACA replacement bill is simple: Does the bill protect access to quality, affordable, equitable healthcare for vulnerable communities? After reviewing the House GOP replacement bill, the answer is a resounding no. Instead of providing greater health security, the bill increases costs for older and sicker patients and drastically cuts the Medicaid program, all while providing huge tax cuts to wealthy corporations and individuals. This is not the faithful way forward and must be rejected. Young Invincibles: House Republicans introduced a bill to repeal and replace the ACA, which would have devastating effects on millions of young adults, a group which has seen the greatest health care gains under the ACA: in the past six years, Millennial uninsurance rates have dropped from 29 percent to 16 percent. Planned Parenthood: One in five women in America has relied on Planned Parenthood, and their health care shouldn't get caught up in congressional Republicans' extreme agenda. This proposal would deny millions of women access to cancer screenings, birth control, and STD testing and treatment. Previous posts have noted the Trump team's misstatements, misspellings, and punctuation mistakes. During the summer, speechwriters for Melania Trump plagiarized a speech by Michelle Obama. Monica Crowley had to withdraw from an NSC job because she had plagiarized portions of her dissertation. "Free Trade ... Has to Be Fair Trade"